Five years ago myself and former Irish Independent colleague Karl MacGinty had a long chat with Pete Cowen at Doral. (It's so long ago that Donald Trump was nothing more than a reality TV star at the time). In the light of Sunday's Open Championship victory by his pupil Henrik Stenson, it's worth looking back at what makes this extraordinarily hard-working Englishman tick. Having seen them grind on the range from Tucson and Tulsa to Turnberry, here's a quick taste of one of golf's great characters. Respect yourself, don’t show anyone your weakness. Respect the people who help you. If you live your life by the three ‘R’s’ you’ll be a better person, that’s for sure. People like Dyson and Finch when I was with the English Golfing Union and I did the same with the Irish lads as well. I sat down with them and told them the same thing. That’s the same with any walk of life, not just golf. I know a million kids that want to be great players but I don’t know half a dozen that need to be great players. So you look them in the eye to see if there is that need to be the best. And in the top players you can see that need, they’ll always look straight back at you, not looking past you. They almost look into you, and you know they need it. I’ve known Graeme an awful long time, obviously through ISM. He has always done his own thing really well and decided what he wants but I think Graeme got into far too much technical and not understanding how good he was with his matching movements. He looked for technical perfection instead of matching movement perfection, which is totally different. Unless people understand the mechanics of the golf swing, they don’t understand matching movements and how they work under pressure. If you don’t use the constants you’ve created yourself, the movements that have been developed over years and years and year, and match them, then you won’t achieve your full potential. There isn’t another level for him to go to. He’s in the top-5 in the world and has won a Major. There’s not many people have ever achieved that. No, there is no other level – there’s improvement in what he does. You can get better all the time. The actual level is continuing to improve yourself as a person and as a golfer. And if you improve yourself as a person, you’ll definitely get better on the golf course. It’s how you conduct yourself on the course. Tiger’s body language doesn’t say he’s in command of myself. He’s lost that body language, that mystique. Hogan had the mystique. I never played with Hogan, I played with Snead. Hogan had that mystique more than Snead had. Tiger had that until two years ago. Gary Player had it for a while. I played a lot with Player and it was almost like there’s something around this guy that’s something special. Guys at that level had an aura around them, they are unbelievable players and a lot of it is work ethic. Can someone like Graeme develop that aura? Well, he’s something completely different – he’s a people’s person. Some people hero-worship people because they can’t get close to them. Others because they really are normal, nice people. That’s where the three R’s come in. Somebody who respects themselves and others have a presence. They have something special. They try all the time to be a better person. People say to me ‘nobody knows you’ but people in the game know me and that’s all that matters to be honest. Alright, the prime minister wouldn’t know me, though I’m UK Coach of the Year, beating Andy Flower (England cricket coach) into second place. Well the Prime Minister rang his up to say ‘well done for winning the ashes’. He didn’t ring me up and say ‘well done, you’ve won two Majors and got No 1 in the world’. If I’d got a tennis player to No 1 in the world, he’d have been on the phone to me but David Cameron wouldn’t know me from adam … and I’m more successful than all those guys put together. He wouldn’t know me but that’s how I want it to be. That’s my own approach. What pleasure do you get from it all. What drives you on? I would have loved somebody to have done it with me. To have taken the time. When people ask why I am a good coach, I say there’s one big reason: it’s because I care. Serious, that is it. I care about the players improving, understanding what I say and it’s all about them getting results. There’s only one thing that makes a great coach – results. I don’t perceive myself as a great coach but my record and my victories say I am. I don’t want to call myself a great coach but 120 wins on the European Tour and all around the world and two Majors must mean I’m doing something reasonably well. Alex Ferguson is a great coach because he’s done it. I wouldn’t say I’m as good as Alex Ferguson but, in my game, I’m actually successful. The most enjoyable part is the journey. When you actually get there, you sometimes think ‘that wasn’t quite what I expected to happen’. When Graeme won at Pebble Beach, that wasn’t quite what I expected to happen. All week, he’d been saying ‘I think I’ve got a big one in me, you know that’. He was so high, so calm, so confident. You really could sense something was happening that week. On the range, he was uptight a little bit but not in a bad way. You really could sense something was going to happen – it was unbelievable, it really was. And then with Louis, I was on the range with him at 6.30 am before the second round and Zach didn’t turn up, he was a little late. Louis was perfectly calm. Give me a nine iron, I’ll tip a few here. That’s the great thing about Louis, he’s always himself. He’s brilliant because he is himself. And Lee. I’ve known Lee since he was a little lad and the desire has always been there. When we got to No 4 in the world in the first time, in 2000. He was No 1 in Europe and won 25 times in five years, then he left me. He wanted to try and improve, which is fine. You can’t blame people for wanting to improve. When he was fourth in the world and No 1 in Europe in 2000, he said he wanted to go to another level. I told him ‘Lee, there is no other level … all you’ve got to do is improve your short game’. He was made believe the right thing to do is try and draw the ball but you can’t draw the ball with a natural 17 degree bend in your arm You might pull it a little bit but if you move this (tapping elbow) you’ll hook it and that’s what happened. In those five years when he won 25 tournaments, everything started down the left and it was a constant. I know from my own playing days, if you got rid of one side of the course, it was very easy to play. But then when you bring in the other side of the course … he starts sniggering. In the last few weeks we’ve started putting a little pressure draw back into his game now. It is a bit of a trip into the unknown for him because he hasn’t been there for so long? It is but he now knows how to do it properly. He didn’t know how to do it properly before and because he didn’t have the technique to do it properly, he was manipulating, which obviously then became a problem. He just hit two little five irons into the last two holes which just held into the wind. He’s a lovely lad, I enjoy working with him. I wouldn’t work with anyone I didn’t like. The fact is, they ask me and, unfortunately, I’ve probably turned down more than I’ve accepted. What do you like about Graeme? Well, we get on well together. Him, Ken and me. Ken is the fall guy there all the time, forever having a go at Graeme in a nice sort of way and I can join in. We have a banter. I can take the piss out of him and he likes that. He likes people coming at him because he can use his sharp wit to come back and put you down. He likes giving as much as he gets. The way he goes around the golf course, plotting his way on Tuesday and Wednesday, his practice rounds are more productive than most. He’s seeing the shots. Before the shot’s arrived, he’s seen it. You can see him thinking ‘that’s the place, this is the movement I like’. He’s as good as I’ve seen when it come to plotting a course, yeah. Is it a case of getting to Augusta, information overload? Your problem at Augusta is probably you don’t get enough time on the greens to get acclimatised … they are probably two or three foot faster because of the slopes and the way they are cut. They never give you a stimp reading etc. Has Graeme always been a winner? It’s a desire to win. And he’s not afraid of failure. If they’re coming down the stretch, they are pumped up trying to win and not consumed by the fear of failure. 99 per cent of people get confidence from this side of the line and one per cent get their confidence from the other side of the line. The 99 per cent say they get it from ability. The other one per cent get their confidence from knowing they’ll always do their best – they can’t do any better. One of the great things I like – you can’t always be correct but you can always be committed. You can be wrong a few times but you can always be committed. Rory was brilliant. If I showed him a shot and told him he couldn’t play it, the next time he saw me, he’d show me he could do it. ‘You know that shot you were showing me? Well watch this,’ he’d say. Dyson used be like that at age 12 and 13. Where were you on Sunday at Pebble Beach? I was at home. I left on Saturday. I don’t like standing behind the green and seeing it all unfold. That’s for parents, families. It’s never been my thing, running on the green. I’m not into that. I’m satisfied with the result. Did you sit at home watching it? Absolutely, I watched every shot. It’s difficult but you’ve got to watch it. He must have known he wasn’t going to hit it into the ocean at 18? We’d discussed that all week. He always was going to play it as a three-shotter, though they wavered a bit on Sunday. But he said this is a three shot – this is how we are going to play it. That’s what I’m saying about his attention to detail. That was always in the bag from Tuesday, Wednesday. You must get very emotionally involved? It’s difficult because you know you have really put the hard work in. If the player wants to work hard I’ll be there with him all the way. When I was a player, nobody could drag me off the range. I was absolutely the last one there. Me and Vijay used have competitions to see who could stay out there the longest. If I knew then what I know now, I wouldn’t do it. I’d be much more productive with the way I approached it. I think we do too much punishment practice. Punishing yourself into being a good player or punishing yourself for not playing well is very unproductive. How are you going to improve. Decide are you going to improve mentally, physically and technically and identify how best to do it. Get a proper plan and prepare correctly. Poor preparation precedes poor performance. Pebble Beach, Graeme’s short game? We went into the rough. When you are in there there’s basically four shots you can play. So as soon as you see the lie you should match it to shots. Instead of trying to guess what one should I play out here, you look at the lie and it’s definite. It’s that, that, that or that – definite and when you’ve got a definite, it’s always easier to commit. When you’ve got a doubt, it’s more difficult to commit. Bunker play, eight out of eight last week at Honda. Used that be an issue? When we went in a bunker at Tucson, he went back to some of his old habits, which is something we all do unfortunately. So we go through it again in practice and he says ‘aw yeah’, and it’s back on track. I’m definitely a better bunker player than all these guys, without a shadow of a doubt. There’s probably only Brett Rumford who can get near me. Player was my big idol and I spent hours with him in the bunkers and he told me how to do it. But Seve was the one who taught me how to improve my bunker shots and he didn’t know how he did it. I had to watch him to see how he did it. It was totally different. Seve was the first one I saw to run a ball straight on the putting surface after a bunker shot … it’d bounce and run straight into the cup. Even when I was a good bunker player as a kid, I used to get a lot of sidespin when it came out. So when I asked Seve how to get it to run out straight, he said ‘you do this’ but I had to watch and find out for myself. If you watch the sand, it’s how you move the club through the sand, it gets the sand working and it makes the ball spin in a straight line. You release the club into the sand, unlike most people who cut across the sand … though you have to release it properly. Absolutely. I went for lessons with a guy called Gardner Dickinson up the road here at West Palm Beach in 1978 and he was one of Hogan’s disciples. I couldn’t go and see Hogan, though I asked Gardner Dickinson could he arrange for me to go and see Hogan practice. He said look, I can ring Mr Hogan and he’ll say send him down. You’ll get to Fort Worth tomorrow and he’ll say ‘nah, nah’. He said stay here and watch Jack Grout teach Jack Nicklaus. So I’d 10 lessons with Gardner Dickinson over a two week period and watch Jack Grout teach Jack Nicklaus, he actually taught Ray Floyd at the same time. Everybody thinks lessons are expensive now. I paid $200 an hour 33 years ago. It cost me $2000 and it was a complete waste of time. When I look at all my notes and know what I know now, it wasn’t worth it. It sounded great at the time but since then I’ve learned a lot more. What did you like about Hogan? His work ethic more than anything else and I don’t think people understand how good his body action was – the body action is the engine room and the engine can control everything. If you move the body correctly, it can help you to draw it. His body movement matched his arms and you could always tell at the finish whether he’d hit it with a draw or a fade. When you go in to teach someone, you’ve got to look at the constants in their swing. So you use that constant because it’s always there. It’s more of a sequence of movements. People probably would have been tempted to try and change Graeme’s swing? Absolutely, I knew that straight away but you’ve got to find out what the strengths are. People would look at his (bowed) left wrist but that’s a strength, it’s not a weakness. People have to know how to use strengths and that’s the essence of a good coach. I’m now 60. I’d like to do this for the next 10 years but whether my wife, Frances, would let me or not… though she’s so used to having me away, she wouldn’t want me under her feet at home (near Sheffield). Probably finding my wife, because without her it just wouldn’t have happened. Found her at the driving range where I used practice. As a player, I had to work during the winter, so the only golf I got was at the driving range, I used to turn the lights out at the driving range every night. I used to hit as many as I could until they closed at 10. Lights off and my wife worked down at the bar and because I didn’t drink, I used drive her home. I used work in a grinding wheel factory, and Marks and Spencers and Debenhams. You played all summer, in the winter time you went to Africa but you had to sponsor yourself. There was no money. In 1979 I think I finished 56th in the OOM. Well 56th would win E600,000 now but I lost money that year. I was age 28 and I packed up because I’d a daughter two years old and had responsibilities, so I took a club job. That’s probably how it was meant to be. The guy who finished one place in front of me that year was Bernhard Langer – he was four or five years younger than me at that time but you still never know how things might have turned out if I’d carried on but I couldn’t afford to. In golf, what was your greatest achievement? I think when I won the Zambian Open in 1976 and I bought my first flat with the money. I holed a 10 footer on the last hole to beat Jack Newton by a shot and the first man to greet me was the bookie, who stood to lose a fortune if Newton had won all three tournaments we were playing out there. He’d won the first two. “I was going to lose a fortune, now I’ve won a fortune, you can have what you want.” Won £3,000. British Amateur Men's, English Amateur Men's and Ladies English Amateur in 1993 .. all of them were under 18 players. Year after that, Westy comes along and Chubby asked me would I help him – I think it was 95, he’d played 11 tournaments and he’d only won €7,000 and was really struggling. So they sent him along and Chubby rang and asked how I thought we’d got on. So I said if he does what I told him, I think he’ll earn half a million quid. He’s an unbelievable putter and he has the game for it. And at the end of that year, he’d won €700,000 and two tournaments. Yeah, that was great. Tremendous. At 46 they didn’t think it could be done. Players can win well into their forties now? It’s the technology. I hit the ball further now than when I did on Tour and I used hit a long way when I was 20 or 21. I then slipped a disc and was out of the game for two years. What are the ideal qualities for winning a Masters? You have to have massive patience and massive discipline. Sometimes you have to play away from flags and Nick Price always said he couldn’t because he was an aggressive player. 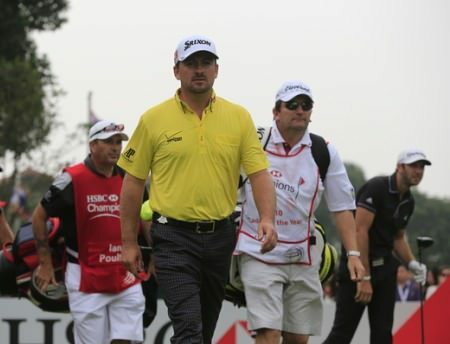 Yet Nick Faldo could play like that – if somebody said to me, you played with both, who would you class as the better ball-striker, I’d nominate Price as an unbelievable ball-striker, certainly an equal of Faldo but Faldo had the discipline and he was a fantastic chipper. You look at all the players that won there – Seve, Olazabal, Langer, O’Meara, Mickelson, all the guys. Then you’ve got somebody like Nicklaus who wasn’t a great chipper but he was a great putter … he had something to overcome that. When you see him practice, he has massive discipline. Drills he must do day-in, day-out, and he’ll do them religiously all the time and he’s almost on auto pilot from there on. He’s not thinking about what he’s doing and he always goes for the hole. Great putters will sometimes three-putt from three feet but bad putters never will. Is Augusta the ultimate test in golf? It doesn’t examine your driving a lot. What Mickelson did to Lee last year, on eight, nine, 10 and 11, he should have had four bogeys there. That one on eight came back out of the trees, anyone else would have lost two balls in that stretch. I think the only way he took on that shot is he already had two Green Jackets in his locker. I’d love to show you the contract I had with Uniroyal – three balls a month in winter and six balls a month in summer. I got a dozen and a half in the spring for six months. You basically had four and a half dozen a year and they get that much a week now.